WASHINGTON, DC, January 9, 2014 (ENS) – The Obama Administration has approved extension of International Space Station operations to at least 2024 from its current deadline of 2020. John Holdren, director of the White House Office of Science and Technology Policy, and NASA Administrator Charles Bolden announced the proposed extension late Wednesday as more than 30 heads of space agencies from around the world gathered in Washington for an unprecedented summit on the future of space exploration. “We are hopeful and optimistic that our ISS partners will join this extension effort and thus enable continuation of the groundbreaking research being conducted in this unique orbiting laboratory for at least another decade,” they said. Launched in 1998 and involving the United States, Russia, Canada, Japan, and the 11 participating countries of the European Space Agency, the International Space Station has been visited by astronauts from 14 countries. Weighing over 900,000 pounds and spanning the area of a football field with its solar arrays, the Space Station supports advances in human health and exploration and demonstrates technology to enable future exploration and research in basic life and physical sciences, and earth and space science. The Space Station completes 15.50 orbits per day at an altitude of between 330 km (205 miles) and 435 km (270 miles) above the Earth. 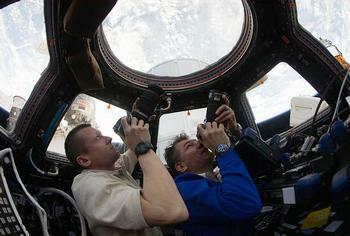 Humans have been aboard since November 2, 2000, the longest continuous human presence in space. The ISS is playing an increasingly important role in the study of the Earth and its changing climate, said Holdren and Bolden. “In the next few years, the ISS will host several Earth- and space-science instruments, including the Stratospheric Aerosols and Gases Experiment (SAGE III), the RapidSCAT ocean winds measurement instrument, the Orbital Carbon Observatory (OCO-3), the Cosmic Ray Energetics and Mass (CREAM) experiment, the Calorimetric Electron Telescope, and others,” the two executives said. “Ensuring the stability and availability of the ISS through 2024 will instill confidence in the science community that the ISS platform will be available for important, long-term research endeavors,” they said. The ISS is funded until 2024 at $3 billion a year and William Gerstenmaier, associate administrator for NASA’s Human Exploration and Operations Mission Directorate, says no additional funds will be needed through 2020. “We’ve got enough spares, and there’s no unique budget process we have to go through other than the we do each year,” he told reporters on a conference call Wednesday. Senator Bill Nelson, a Florida Democrat, said the extension will add jobs in Florida, which lost jobs to retirement of the space shuttle. “It’s inevitable,” said Congressman John Abney Culberson, a Texas Republican who sits on the Commerce, Justice and Science Subcommittee of the House Appropriations Committee, which funds NASA. Holdren and Bolden said the extension of ISS operation will allow NASA and the international space community to accomplish a number of important goals. It will allow NASA to complete necessary research activities aboard the ISS in support of planned long-duration human missions beyond low-Earth orbit, including NASA’s planned human mission to an asteroid by 2025 and to Mars in the 2030s, they said. “A related critical function of ISS is testing the technologies and spacecraft systems necessary for humans to safely and productively operate in deep space. 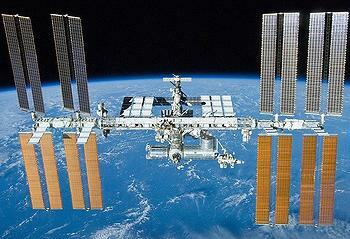 Extending ISS until 2024 will give us the necessary time to bring these systems to maturity,” they said. The ISS extension will give NASA and its private-sector partners time to more fully transition to the commercial space industry the transportation of cargo and crew to low-Earth-orbit, allowing NASA to focus on developing the next-generation heavy-lift rocket and crew capsule necessary for deep-space exploration. The extension will extend the flow of benefits to humans from research on the station. Medical examples include potential vaccines for Salmonella and antibiotic-resistant strains of bacteria, robotic surgical techniques for previously inoperable tumors and a technique for delivering cancer treatment drugs to tumors without harming healthy cells. NASA has determined that research on ISS is necessary to mitigate fully 21 of the 32 human-health risks anticipated on long-duration missions, Holdren and Bolden said.